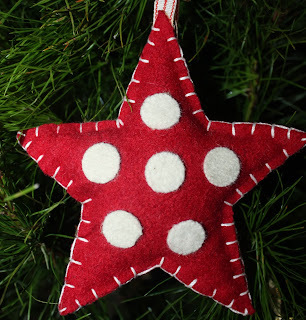 The Office of the Quilters' Guild of NSW Inc will be unattended from 3pm December 13 2013 until 10am January 13 2014. All phone messages to the office will be accessed periodically. Guild attendees at last weekend's year end General Meeting were treated to a Thread Painting Demonstration by member Cathy Jack Coupland. Cathy very generously shared the many tips and tricks that she has formulated over the years whilst producing through freestyle machine embroidery, ever increasingly exquisite and perceptive Fibre Art. Moving beyond sheer pattern decoration and shape and colour relationship exercise, Cathy's philosophy of 'Sense of Place and Belonging' is being explored in increasingly personal works. Inspiration evolves from varying sources and with a commitment to excellence, Cathy devotes many hours to the perfection of her design work prior to the commencement of final works. The Quilters' Guild of NSW Inc is blessed to have a Fibre Artist of Cathy's calibre within their midst, and on Saturday presented her with a well earned Teaching Certificate. Cathy is an accredited Teacher of Special Techniques. St Vincent's Hospital is once again supportingThe Quilters' Guild of NSW Inc with their display of one of the 'travelling suitcases' Challenge Quilts. Currently on view in the first floor corridor between the Public and Private hospitals is the 2012 Pearl Challenge. Due to Display Case constraints, some of the heavily encrusted quilts have been unable to be included at this venue. These quilts can be seen by the public until January 10, 2014. A challenged, yet enthusiastic group of quilters met at Epping Creative Centre this week to be inspired by the colourful, patient and comprehensive instruction of Guild Teacher, Jane Gibson. With careful attention to fabric pattern detail, sharp cutting and piecing, and the ever encouragement from the maestro of 'Miniatures', attendees were soon overcoming their fears to produce delightful teeny tiny blocks, complete with sharp corners and submissive seams. 'Tricks' and short cuts to construction prowess were freely discussed, 'finishing' foibles were addressed, new insights into fabric selections were gained, and the perceived horrors of bias edged miniature triangles were soon dispelled. This was an inspiring workshop and Jane ensured everyone had fun whilst creating stunning blocks for future Miniature Quilts. Rhonda and Isabelle enjoying every moment. Catherine's magical and minuscule Log Cabin "homework" with the fabric used in construction. And the New Year Resolution? Join other Guild Members in 2014 for a workshop. Companionship and Creativity guaranteed. The final 2013 General Meeting of The Quilters' Guild of NSW Inc will be held on Saturday 30 November. A different way of conducting meetings is to be trialled. During the "Business" part of the 1pm component, an update of what the committee have been doing since the previous meeting will be briefed, with verbal reports from Committee and Subcommittee members being given only if there is something important to relay. All reports of a general nature will be displayed for individual perusal on a notice board at the function room. There will be opportunity during the meeting for matters regarding the reports, to be raised, if required. This format is a Trial Only. Fine tuning and changes can be made for future meetings. The Constitution Subcommittee will be presenting the new Constitution and advising upon recommended changes, with any questions and queries to be addressed. The subcommittee will give a presentation on the draft constitution at the 30 November general meeting of the Guild and be available to answer questions. Any comments on the draft must be submitted to the Guild secretary by 16 December 2013. The Committee will then settle the draft to submit to members so that the constitution and resolution for approval will be sent to members with the Template quarterly newsletter in February 2014. The resolution will be tabled for approval at the April general meeting of the Guild. Your input is welcome. This is an opportunity for members to participate in the development of the new constitution and to ensure the new constitution addresses the Guild’s current and future needs. 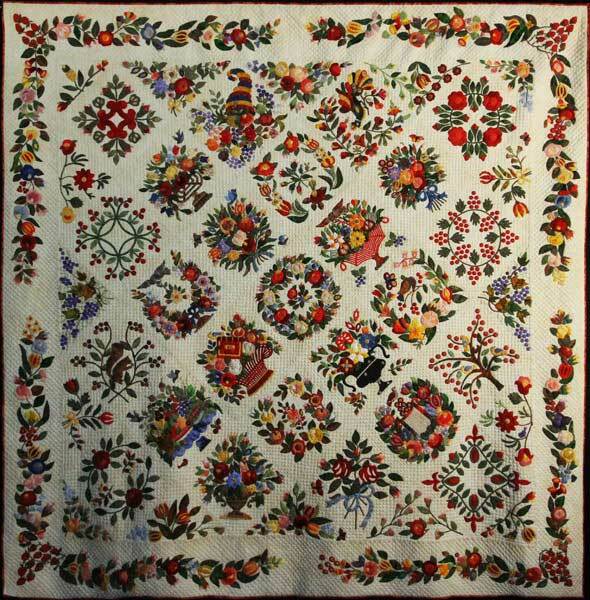 At the recent International Quilt Festival 2013 in Houston, well deserved excitement emanated from the Australian quarter! A number of Australian Quilters were awarded Prizes and International recognition for their artistry and creativity. Congratulations especially to Margo Hardie of Lake Haven, NSW, one of two recipients of The Founders Award sponsored by International Quilt Festival. Both she and the other winner made Traditional style quilts. Both receive $7500 as prize money. Rhonda Pearce of Glenbrook, NSW was awarded First Place in Traditional Applique Sponsored by Quilters Newsletter, for her "Baltimore Classic". 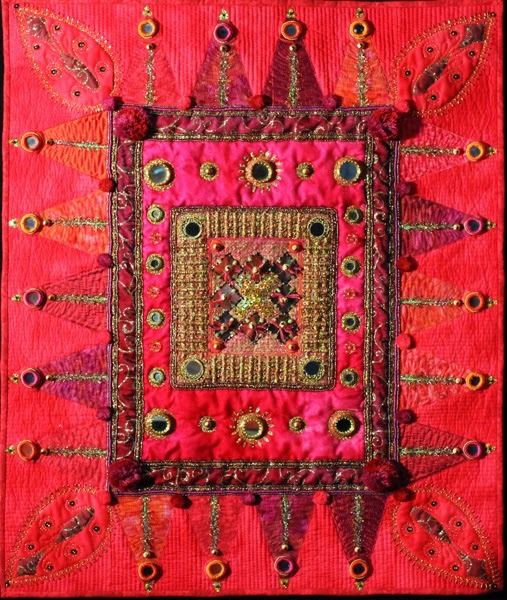 Members may remember her showing this quilt during its construction phase at a Friday Showcase, and once finished, Rhonda displayed it in The Masters Section of The Sydney Quilt Show 2012. Both Helen Godden and Jenny Bowker received Honourable Mentions for quilts. Jenny, from Garren Canberra, ACT, entered "The Quiltmaker", in Art - People Portraits and Figures; her tribute to Australian quiltmaker Margaret Rolfe. Congratulations to all of these Australian Quilters. 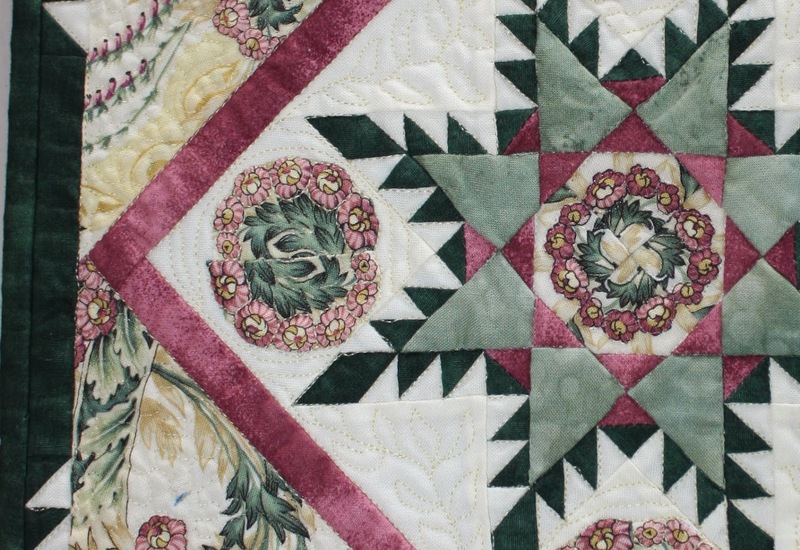 News from Campbelltown Patchwork and Quilters Guild of their forthcoming Quilt Show will delight all quilters who enjoy touring the Spring quilt shows around the State. Along with the Members Exhibition there will be sales tables and traders, and a refreshments stall. 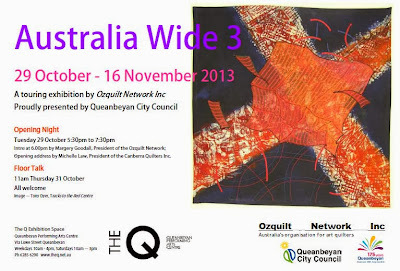 Australia Wide Three is a touring exhibition presented by Australia's organisation for art quilters, Ozquilt Network Inc. With support from Queanbeyan City Council, the exhibition next opens at The Q Art Space, Queanbeyan, ACT at 6.30pm on Tuesday, 29 October 2013. There is an artist floor talk at 11am on Thursday, 31 October. All welcome. Please RSVP. Rumours are that "Miniature" piecing and design skills will be needed for the 2014 Guild Challenge. And who better to divulge the intricate skills of Miniature Quilt construction than the maestro of tiny piecing, Jane Gibson. 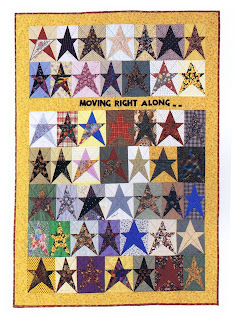 A Star Sampler Miniature Quilt Workshop will be taught by Jane at the end of November. In this class, participants will learn the tricks of tiny cutting and accurate piecing using a rotary cutter and sewing machine. They can choose to copy the quilt Jane presents, or make one using their own design. A variety of block patterns will be provided to help in selection. She will also help those who are intrigued by the intricacies of constructing 1/8th inch logs, as shown in the tiny Log Cabin Quilts that Jane is known for. She says there is a very simple method to sewing tiny logs, and is willing to share her technique during the workshop. A downloadable Workshop Booking Form can be used or the hard copy (or photocopy) of the form can be used from page 29 of the August Template. Cost : Members $65 / Non-members $100. 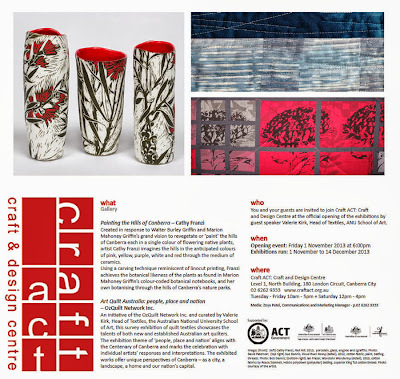 You may also be interested in the curator and artist floor talks that are part of the Ozquilt Network Conference My Art Quilt 2013 on Saturday, 2 November. Non Ozquilt Network members are welcome to attend the conference. Complete and return the registration form in the information pack or make your booking using the Conference Gala 2013 Online Registration Form. Conference bookings close on Tuesday, 29 October 2013. Leanne Harvey, long arm custom machine quilter, patchwork and sewing teacher, published designer and blogger at Mount Vincent Quilts, will present her textile journey at the next Friday Showcase in the Office. Recognised for her creation of big, bright and modern patchwork, Leanne says it is the quilting that makes a 'flimsy' come alive for her. She is equally passionate about finishing off the masterpieces of her clients, with individual and beautiful quilting on her Gammill. This love has now become a family business and, as she says, " I'm very lucky to work in a job that I love to do"
Leanne has been published in Down Under Quilts , and Australian Quilters Companion have one of Leanne's quilts, 'Lucy', in their current publication - Quilts from Precut Fabrics. 'Lucy' is a colourful and bold quilt made from 2 Layer Cakes and Leanne is holding this quilt in the above photo. All members are welcome to Friday Showcase, so please come and support this young passionate, and rural member of the Guild. Images of the current NSW bushfires have been saturating the worlds media, and for those who are uncertain of the locations of affected areas, then be advised that much of the devastation has occurred in the commuter belt of Sydney. Almost everyone in Sydney knows of, or works with people who live in the active fire zones. The Office of the Quilters' Guild of NSW Inc has been fielding a steady stream of phone calls from concerned members wanting to "help" in any way possible. Tracy Greenway at Winmalee is the quilter to contact directly. 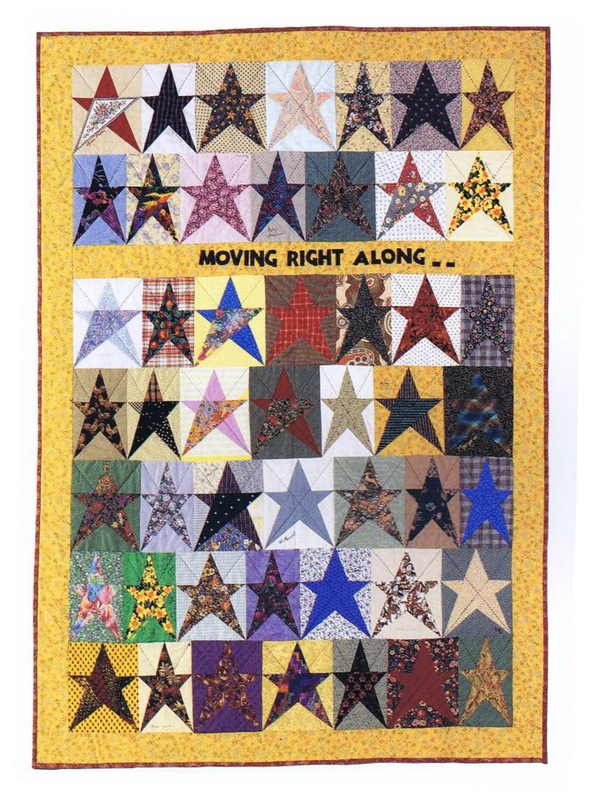 Her blog: cookquiltcrochet has an update about The Springwood Salvation Army Patchwork Group who are co-ordinating a Blue Mountains Quilt Appeal for those who have lost their homes in the Springwood and Winmalee areas. There is an 'email contact' section on Tracy's blog for those who wish to contact her directly with donations of quilts. Please do not donate quilts directly to the Salvation Army Charity Store in Springwood. These quilters are also wanting donations of tops and all supplies needed to make quilts. A list of donation suggestions is also on the blog. Please help in any way possible. Thankyou. The bi-annual "Quiltaway" being organised by Illawarra Quilters is fast approaching, and there are still vacancies for those who wish to join this 'not-for-profit' Workshop Long Weekend. Guest Tutors are all well known for their creative and fun classes, and attendees will not only learn new techniques and produce 'take-home' items, as well they will have their creative energies inspired for future projects. Jennifer Corkish (teaching The Fruits of Life and printing and stencilling) all still have places in their classes. Final numbers are needed by November 1st for all the 1, 2 and 3 day workshops being offered. The Quiltaway is being held at The Tops Conference Centre, Stanwell Tops NSW. Attendees are to arrive after 5pm on the 15th and departure is 4pm on Monday 18th November. A $50 Deposit will be required if a place is to be reserved until a Registration Form has been posted. Nothing to do except sew, learn and relax in good company! During the Awards Ceremony at the recent Queensland Quilters Inc Show, one of the prize winning quilts was brazenly removed from display prior to ribbon pinning. 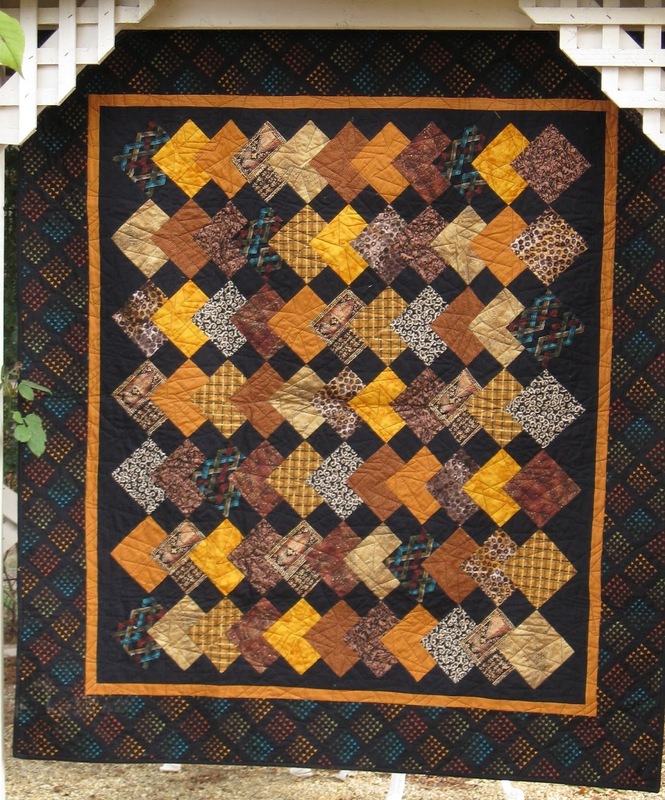 Titled " Feathers Unfolden" and created by Brenda Wood, this quilt measures 73cm x 43cm. 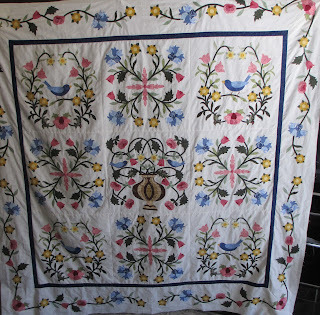 If anyone recognises this quilt and knows anything about its theft, then please contact the President of Queensland Quilters Inc Lyn Crump , or Expertise Events. Unfortunately, Security Cameras at the event missed recording removal from display. Any detail or clue about the perpetrators will be treated with diplomacy. Please publicise this theft amongst your groups and quilting friends. Those Curlewis Quilters, Good ol' Merle and Miss Shirl, have been touring the recent Spring Quilt Shows . . . .
Shirl : OOooooo, I like that one . . .
Merle (muttering) : . . no surprises there . .
. . . . . Shirl . . . doesnt matter whether you like it, does it fit the criteria? Shirl : Par. Don. mwa? 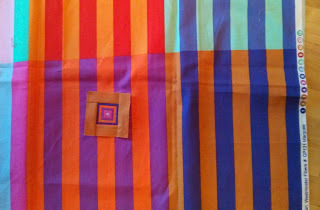 Just look at this Mariners Compass quilt Shirl, and do try to use a more critical eye. Shirl : Hmmmmm . . . I suppose the seams are a bit wonky ..
Merle : Exactly. Any more wonky and we'd be seasick. enough on the borders compared with the body . . . see . . it doesn't hang straight! Shirl : Gosh, didn't notice. entered into the correct category! Shirl : Hell Merle, Curlewis one week, Houston the next . . . how do you know all this? Merle : The August Guild Meeting. Super presentation by some members who are Judges. Got us all thinking. Even had to do some pretend judging. Shirl : Sorry . . . sorry! . . . what else did you learn? colour running, no puckering, no lipstick, blood spots and . . . no fluff! Shirl : "Fluff"! . . Fluff ? . . But I've seen Art Quilts with more fluff than Bruce's nosstraws! Merle : SHIRL! I think you mean "Mixed Techniques" . . . see . . wrong category. What they mean is, keep Minxy off your quilt. Shirl : Oooo yes . . . I know that catoffstrophe . . .
. . ghastly . . . . died, didnt she? Merle : Shhh . . Shirl, you're a shocker . . that is SUCH an urban myth . .
Judging Criteria to cast a 'Viewers Choice' in the Hexy Challenge. Shirl : But what if I don't like any of them? Merle : You haven't heard a word I've said, have you? . . . . C'mon . . time to find the tea and scones. All members are advised that the Annual General Meeting of The Quilters' Guild of NSW Inc will be held this Saturday. Please remember to forward any Criss Cross Blocks to the front desk upon arrival for the subsequent "winner - takes - all" BOQ raffle. All Guild Management Committee positions will be declared vacant on this day, and a new committee will be elected. 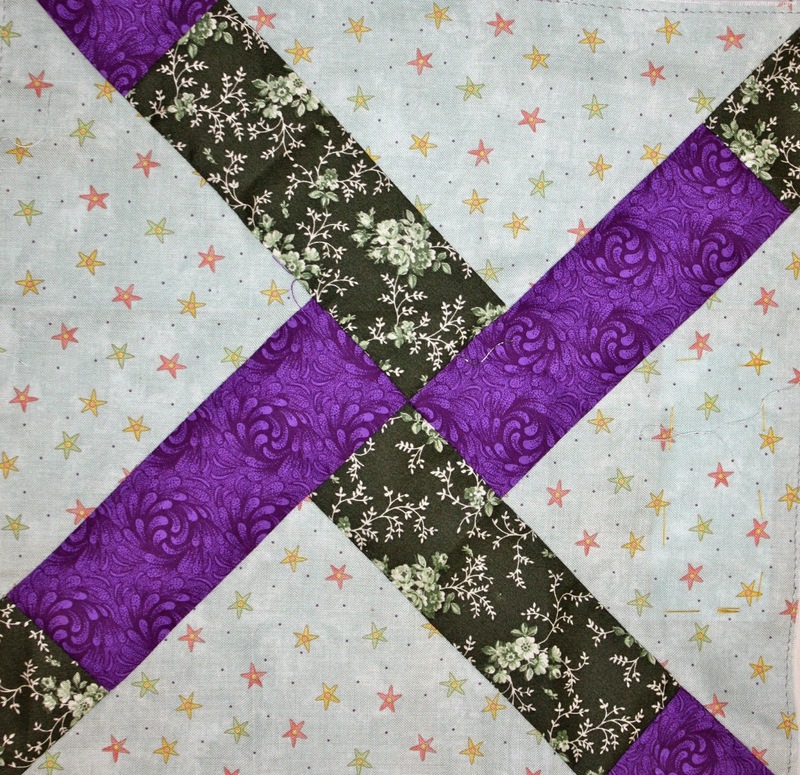 An AGM highlight will be the display of 2013 Challenge Quilts - 'Hexagon Hype'. 62 Challenge Entries have been received this year, and Judging is complete. However, be sure to cast your "Viewers Choice" vote, at the Guild AGM. Which of these Challenge Quilts will be awarded First and Second place? As always there is the added pleasure of a Guest Speaker, and at this AGM, Catherine Butterworth will share her recent quilts and talk about her passion for design and colour. A band of enthusiastic quilters in Mosman have been busily working towards their 3rd Quilt Show. 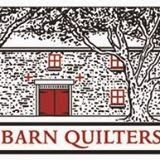 Calling themselves the Barn Quilters, and meeting monthly in The Scots Kirk, Belmont Road, Mosman, their exhibition this year will have all proceeds being donated to The Bear Cottage in Manly. Their exhibition will be held in the historic Community and Scout Hall : The Barn, just near the ferry wharf; ideally placed for those who wish to include a harbour journey with a quilt show! A bus service also runs past the venue. 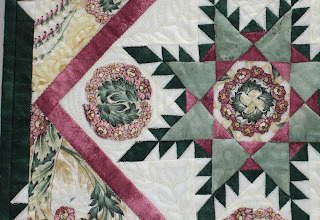 This quilt show is being held in conjunction with the Festival of Mosman. 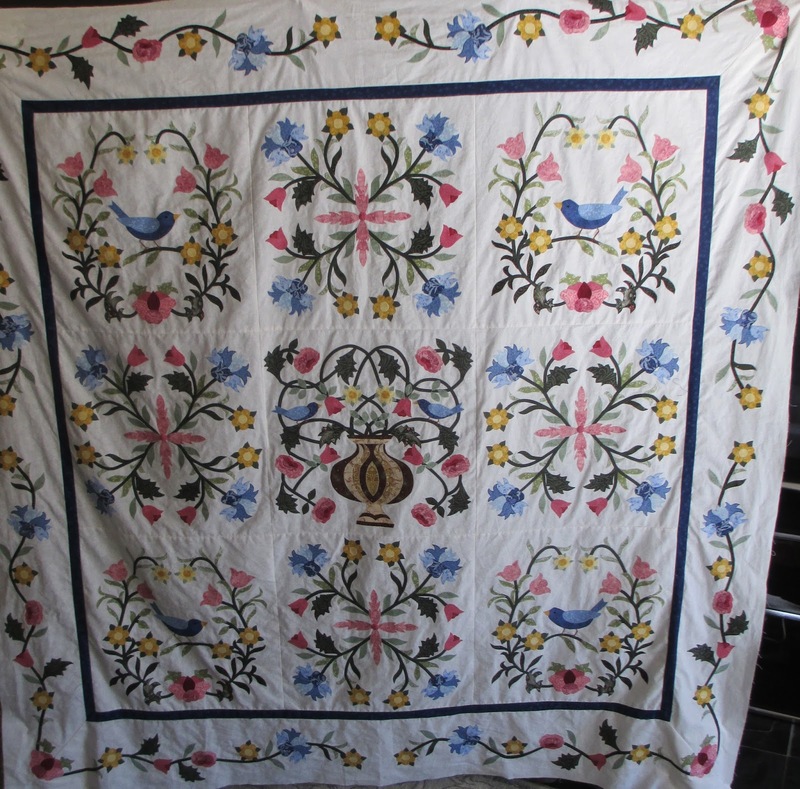 A Raffle Quilt, "Potting Shed", will have tickets available for purchase, and other delights will be a retail shop, as well as a wonderful Morning and Afternoon Tea facility. Please do come along and support Bear Cottage and view the quilting creativity of the Barn Quilters. All Guild members are no doubt familiar with the fabulously graphic "Lots of Dots" quilt created by well known designer and teacher Chris Jurd. This quilt won its category at the 2011 Sydney Quilt Show and has previously been exhibited at the 2012 Australian Quilt Convention as one of the 5 "Best of the Best" from The Quilters' Guild of NSW Inc.
Chris will be teaching a 2 day workshop this month for the Guild, whereby members can learn the intricacies of constructing two of the blocks from the quilt. As a maestro of Foundation Piecing and Applique, Chris is bound to be able to help all attendees make these blocks appear dynamic and professional. Complete "Lots of Dots" quilt instructions will be available for purchase for those inspired to take their workshop results further, and thus construct the other 24 different circle blocks. If you would like to attend this exciting workshop then please phone the Guild Office to register. Further details about the workshop and a Workshop Application Form can be found on page 29 of the August Template. Guild member Brenda Gael Smith is curating another travelling textile art exhibition in 2014/2015 that will premiere at the Australasian Quilt Convention in 2014 and will also be on display at the Creative Textile Show in Canberra. All textile artists are invited to submit an entry exploring the theme Living Colour! Each work will be in a 100x40cm (L x W) vertical format and up to 30 works may be selected. To submit an entry, please review the Conditions of Entry and complete the Online Entry Form. The closing date for entries is 31 January 2014. International entries are welcome. You are invited to join the Ozquilt Network Conference Gala (29 October – 3 November 2013) in Canberra. My Art Quilt 2013 is a professional development and network day for all members of Ozquilt Network. Non-members are also very welcome. My Art Quilt 2013 is the main focus of a 6-day Conference Gala program (and includes a short Ozquilt Network annual general meeting). The Conference Gala program incorporates exclusive delegates-only optional pre-conference and post-conference events, plus free public events related to the program including the official exhibition openings of Australia Wide Three and Art Quilt Australia 2013: People Place & Nation that include the works of many Guild members. All activities must be pre-booked on the conference booking form, including public events. Bookings close on Wednesday, 23 October 2013. 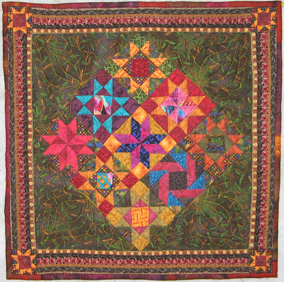 Submit the booking form from the information pack by mail or e-mail or complete the Conference Gala 2013 Online Registration Form..
Members are advised that the next scheduled Friday Showcase will highlight the quilting journey of Sheryl-Ann Schaefer. Quilters from the Canberra region will know Sheryl-Ann as the owner of 'Bungendore Country Patchwork', a cosy and welcoming "small-village shop" which provides inspirational workshops with accredited teachers. The refreshments are quite a highlight at these classes! Sheryl-Ann is famous for helping dispirited quilters finish off that 'UFO' in a "Finishing School Class" and, as well, for teaching a Mystery Quilt class, always popular with quilters needing a new direction. Sheryl-Ann's particular love is overall design, and by exploring the usage of the infinite colour and patterns of commercial fabric, enjoys rising to the challenge of creating a unique and visually exciting "topper". She is relieved there are so many proficient long-arm quilters available to steer her creations from tops to quilts! 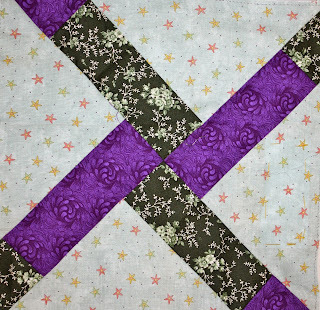 Come to the September Showcase to hear her passion for quilting, first-hand from Sheryl-Ann. Notice to members of The Quilters' Guild of NSW Inc is hereby given of the cancellation of the proposed forthcoming October Quilt Valuation Day. No longer to be held on Friday 11th October, as listed in The Template August 2013 Issue, this event will now be scheduled for Friday 8th November. Apologies for any inconvenience to interested members. Friday Showcase always provides a colourful surprise to members who attend, and with the diverse quilting and patchwork styles of Glen Waples and Marilyn Bell on show this month, there was a quilt for all tastes! Here the members are looking at the fine piecing, applique skills and colourful designs of Marilyn's quilts. Showcase Presenters are booked a year in advance and coincidentally Marilyn has her very vibrant spotted and striped 9 patch 'Kavala' published in the July/August edition of Australian Quilters Companion. Congratulations Marilyn! 'Kavala' (and other quilts from both presenters) is now on the walls of the Guild Offices for all who visit over the next couple of weeks. Rural or distant members who wish to see Marilyn's published 'Kavala' may like to reserve the QC Vol.13 No.4 edition, by phoning the Guild Office. Any magazines can be borrowed from the extensive Guild Library for a month. 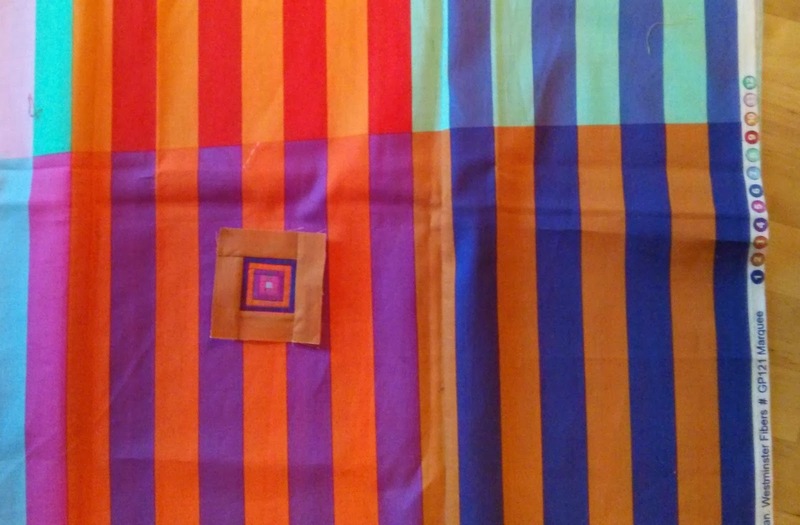 Glen's quilts on the other hand, illustrate a palette of soothing, warm colours. A lover of brown in all its 'chocolatey' forms, Glen creates a more 'traditional' feel to her quilts. Glen's hexagons march across her quilts in their thousands! and like Marilyn, she is a maestro at fine hand piecing and hand quilting. It was a pleasure to hear the quilt journeys of both these talented members. Ever wondered just how a quilt is judged? Then be sure to attend the August General Meeting. Qualified members of The Quilters' Guild of NSW Inc will share their knowledge and expertise, with hands-on quilt samples, to help explain what considerations Judging Panels use, to award varying Quilt Show Prizes. This should make for colourful and interesting discussion! Please bring your own mug for Afternoon Tea.